Stock photo aerial view of a large freight ship in dry dock on the waterfront in the City of Thunder Bay, Ontario, Canada. This stock photo includes a large Freight ship in dry dock along the waterfront in the city of Thunder Bay, Ontario, Canada. 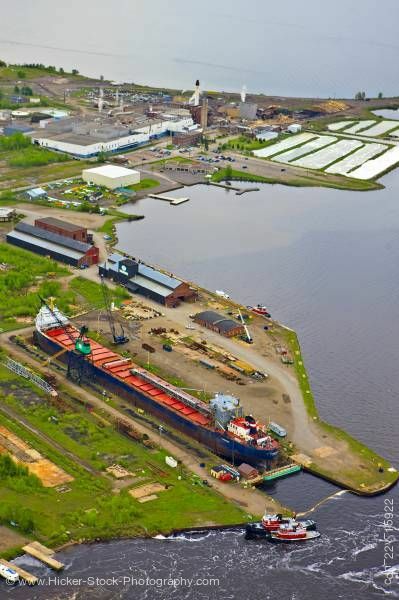 Thunder Bay is composed of two formerly separate cities, Port Arthur and Fort William, and both still retain a large amount of their civic identity, reinforced by the buffering effect the Intercity area has between them. Both Port Arthur and Fort William have their own central business districts and suburban areas.